Fun. Fine Dining. Fantastic Experience. Ever read the book The Tipping Point? It's one of my favorites because it talks about the various roles people play in life. I like to think that I'm a connector among my friends and that I'm a maven when it comes to restaurants. I love giving out restaurant recommendations especially when I get to go on and on about one of my favorite brunch places, Lineage. Recently at a party word got out that I wrote a piece on Lineage and their Eggs Benedict and bread basket. Let's start this blog off right! My favorite thing to do is to eat my way through life. I pride myself on finding the most interesting and delicious foods in all price ranges. My favorite Brookline restaurant is Lineage for its outstanding service, creative and consistently stellar menu and promise to provide fresh and local food. Jeremy Sewall, one of the co-founders and best known chefs in Boston, has his “Lineage” roots in Brookline, hence the restaurant’s name. There’s something magical about the bright and cheery atmosphere paired with the simple and fresh food. The first time I went to Lineage was for a birthday brunch. Part of why I love brunch at Lineage is that I can afford it without thinking twice. Their dinners are for special occasions because they are expensive and exquisite. When you walk through the door, you’re greeted by a friendly host and a daily menu that reflects the freshest local ingredients available. The tables are in two rooms, one with a bar and a hearth oven and the other with a window to the outside. Chef Jeremy purchases local ingredients and will only put tomatoes on burgers if they are in season. Brunch starts with delicious fresh scones, muffins and breads paired with homemade maple butter and jam, which is like having dessert for an appetizer. The hot apple cider comes with an orange and a cinnamon stick. 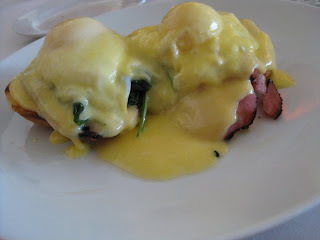 I am an Eggs Benedict connoisseur, and Lineage makes the best. The dish is surprisingly light, and full of flavor. The hollandaise sauce is a glaze, not the focus of the meal. The dish gets better before the knife hits the plate. Eggs Benedict, traditionally made on an English muffin, is instead atop an open brioche, which I have been known to dream about. The homemade brioche is warm, flaky, buttery and the perfect size for the eggs, ham and spinach on top. The truth is that I have yet to order dessert at Lineage’s brunch because I always fill up on the well-worth-it bread basket and outstanding Eggs Benedict. When I go for dinner, I save room for dessert, with the most memorable being corn Crème brûlée. I applaud the use of a savory ingredient in dessert, since it is a creative use of what is freshest on the farm. Lineage is one of the best restaurants in Boston and is a leader of the “local food” movement, and I always feel happy and satisfied when I eat there. The start of something delicious! © Copyright 2012 Food Friends 'N Fun. All Rights Reserved.